3K Gaming Laptops Are Here. Right Now. Gaming laptops have been stuck at 1080p and under for far too long. That all changes with the release of MSI's GT60 gaming laptop, with a display panel that goes all the way up to 2880-by-1620. Also available in workstation flavor, the gaming version of the GT60 is being referred to by MSI as the "industry's first 3K gaming notebook." It's somewhat shaky ground — Apple's 15-inch Macbook Pro with Retina display runs at 2880-by-1800. Then again, if you're buying a 15-inch Macbook Pro solely for gaming, there is something wrong with you. 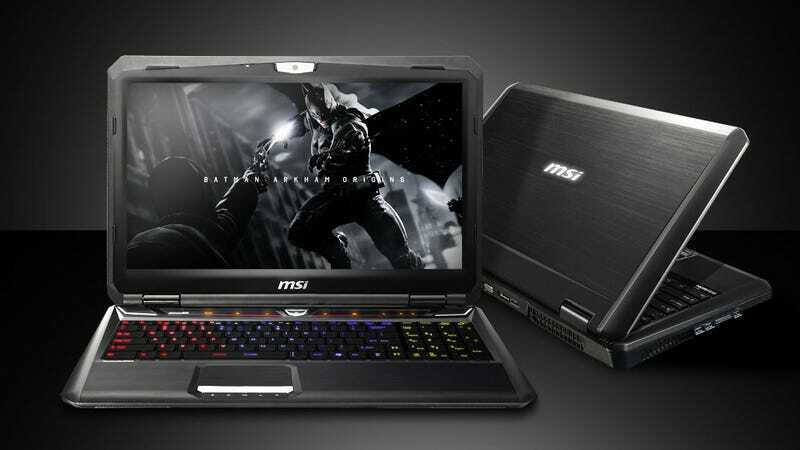 We'll give MSI this first shot fired in the dedicated gaming laptop space. The GT60 gaming model features an Intel Core i7-4700MQ processor, the Nvidia GeForce GTX 780m for those graphics, and 16GB of memory, for those days when 640kb just on't do. We can expect all of the other boutique gaming system makers to have their 3K systems ready shortly, because that's how these things work. Honestly, I'm perfectly fine with a 1920-by-1080 display, but then I am also getting old. Kids today, with their magical microscopic, telescopic eyes — how I loathe them. For an example of what 3K visuals look like on a laptop, see the demonstration image MSI provided with the announcement, below.